The family meal, if you believe the more tawdry newspapers, is a dinosaur. It seems to be accepted that this is A Bad Thing, being that families who eat together, stay together. This belief is also found on British television, most notably via the Bisto family, who themselves have now become extinct. In case you were in any doubt as to whose fault this is: yes, it is women who are to blame. The Bisto Family: So Happy to Be Together. Look at their happy, happy faces. As a member of the demographic scourged by the Daily Mail, I wonder how women who work, commute and keep house (in Tabloid World, men do not help with housework), are also meant to put a home cooked meal on the table every night and make pleasant conversation with those around the table, who’ve contributed sod all to the effort. The notion that families are going to break up if they don’t eat a ‘proper’ meal in the same room at the same time is rather quaint propaganda. The reality for the families that I know with young children, is that mum and dad take turns on making the evening meal, depending on after work schedules, play dates and who wins the argument about who is more knackered that evening. Tummies are fed, baths are had, children go to bed content. Family meals were difficult enough in our house when I was young and we had a mother who didn’t work during the week and a dad who was home by six. My sister and I were not bad children, but we were, shall we say, challenging. If we’d had a mother who worked full-time and had to endure our ungrateful whining at the end of a full working day, I believe I may not be here today, seeing as I would be scampering round in Epping Forest, having being brought up by wolves after being thrown out of the house aged seven. When going to friends’ houses, tea would be served at half past five, after we had changed out of our school uniforms, done our homework and watched some television. In our house, tea was on the plate at half past four, only three hours after we’d had our lunch and three whole hours before we went to bed. Mum made us sit at the table for a full thirty minutes before tea was ready to be dished up and then piano practice straight after. I would make futile efforts to change the order of things, by presenting a logical proposal for either my sister or me getting piano practice out of the way, in the 30 minutes that we’d otherwise just be listlessly sitting at the table. Unfortunately, my mother was one of the most stubborn people on this living earth, so even though she may have seen the sense in my proposal, the fact that she hadn’t thought of it herself, meant that the change would never be effected. Because of the unfeasibly early teatime set for us, we had to be in the kitchen at the precise point that the best children’s TV was starting. This was a major cause of resentment and carping. Missing an episode of Danger Mouse was bad. But not being able to watch Grange Hill, or discuss yesterday’s episode in the playground the next morning, was miserable, the nadir being when we missed Danny Kendall dying in Mr. Bronson’s car. Trying to get us to eat whatever was on the plate with something less than a look of fear or repulsion, was a major victory. My sister had the reputation as a fussy eater in our house but truth be told, we both were. Since having to manage my own food budget, I realise I was lucky to receive a hot meal every night. Unfortunately, I didn’t have the benefit of hindsight when struggling with a particularly gargantuan pile of cabbage and bacon, or chops. Oh God, the chops. Our house didn’t ‘do’ pork, because my mum declared it to be a difficult meat to cook, more trouble than it was worth, so the chop of choice was lamb. I loathed, despised, abhorred lamb chops. Depending on how long they had been cooked, I had to either contend with unyielding, pallid meat which refused to break under the pressure of my teeth, or a steadily forming pool of blood, which menacingly made its’ way towards my beloved mashed potato, while I struggled in vain to form a moat around it with a hastily formed barrier of carrots. Chops were extremely expensive, as I was often reminded when my parents found a discarded half-eaten chop in the dustbin/plant pot/school skirt/cupboard/neighbour’s rabbit hutch/toilet. That as might be, but it didn’t stop them from making me feel ill.
Sausage and mash, with gravy, was a much better prospect, although still not worth missing Byker Grove for. 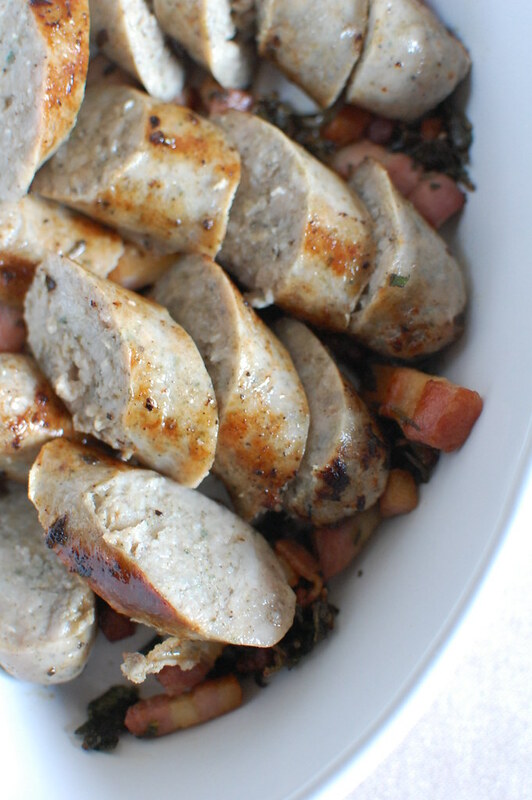 Even though they were the best loved meal, sausages were only the plate once a week. The sausages in question, were the shiny plastic ones that everyone happily bought before the gentrification of food started in the UK in the early 1990’s. I still get an occasional hankering for three shiny Wall’s sausages on plastic white bread, with HP Sauce, and they always hit the spot. Mum’s gravy was The Business. Bisto-based, but onions were put in the oven with the sausages and used as the starting point, along with the water from the vegetables and a dash of Lea & Perrins. I was Chief Gravy Whisker and was not allowed to stop whisking for a second, lest the gravy descend into lumpy hell. The order of washing up duties went: washing up, drying up, putting away, washing down the kitchen. The order of duties was that whoever did the washing up, had to do the putting away. The drier had to wash down the surfaces. No, the order of tasks does not make sense. But this is how things were run. Thus, the washer would be the first one allowed to leave the kitchen. With mum out of the kitchen by this point and the last ten minutes of Grange Hill to be watched, the fight to be the first to leave the kitchen was vicious and to the death. The rules of warfare were swiftly dispensed with and hair pulling, pinching and kicking were deployed in order to establish dominance. Any cries of pain were swiftly muffled with a damp tea towel. I’m fairly sure my mum heard what was happening in the other room but by that point, she probably thought it best to leave us to it while she put her feet up. I don’t know how my mother, or any parent, musters the energy to pitch these battles every single day. But one thing is certain: gravy overcomes all. If your child doesn’t like gravy, you should probably consider testing their DNA, just to make sure that you don’t need to leave them to the wolves. You will also need a pie dish, measuring approximately 23cm in diameter and a roasting tin that can be used over a flame. Turn on the oven to 220C. Have your pastry rolled out, but refrigerated until the last minute. Have your egg beaten and a pastry brush to hand. Have the leaves from one of the thyme sprigs stripped, ready to decorate the top of your pie. If you wish to decorate the top of your pie with pastry cut-outs, make these now and put them back in the fridge until they are ready to be applied. Slice the onions as finely as you can (a mandolin will make a cinch of this). Put the onions into a bowl, add one teaspoon of the oil, a pinch of salt and coat the onions. Spread the onions out in the roasting tin, sprinkle the sugar over the top of the mixture. Add the sausages and put the roasting tin into the pre-heated oven for 10-15 minutes, until the sausages are browned and the onions are well charred. 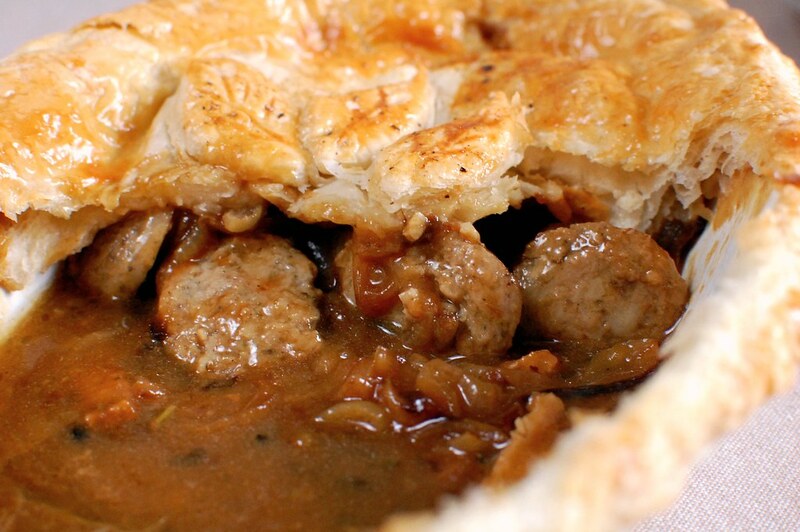 While the sausage and onion mix is cooking, cook the rest of the pie ingredients. Warm the olive oil in a frying pan over a medium heat. Gently fry the celery, bacon and one sprig of the thyme until fragrant, then add the sage leaves, turn the heat up slightly and fry until the bacon and sage has started to crisp. Take the bacon mixture off the heat and check the sausages. When they are browned, slice each of the sausages into 4 rounds, using this time to give the onions a few more minutes in the oven if required. Add the sliced sausages to the bacon mix, leave the onions in the roasting tray. Turn the oven down to 180C and finish the gravy. Stir the Worcester sauce into the stock. 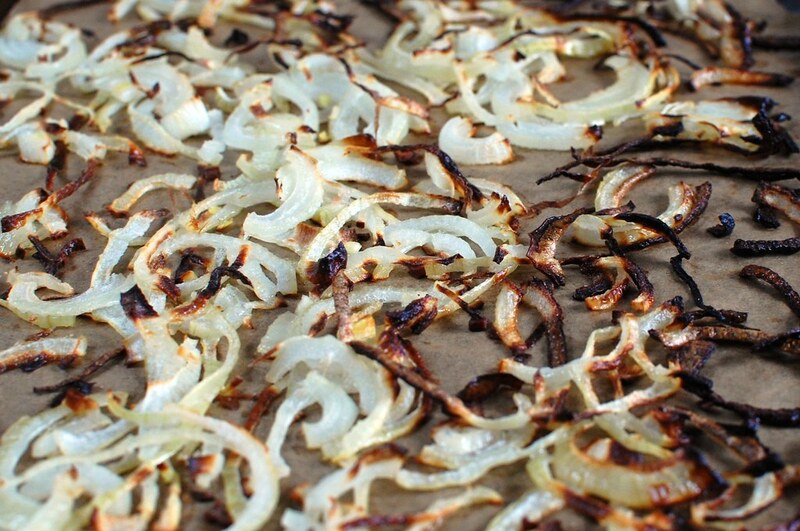 Place the roasting tin, with the onions still in it, over the largest hob ring on your cooker, on a medium flame. Add the other teaspoon of oil and when the onions start to sizzle, start to gradually add the stock to the onions, whisking continuously, until all the stock is added. Switch from a whisk to a wooden spoon, reduce the heat and keep stirring for approximately 5 minutes. Transfer the sausage mix into the pie dish. Slowly, pour around two thirds of the gravy into the dish (the gravy should come about a third of the way up the dish; it shouldn’t be too sloshy). Quickly cover the dish with the puff pastry. Trim and crimp the edges to form a seal. 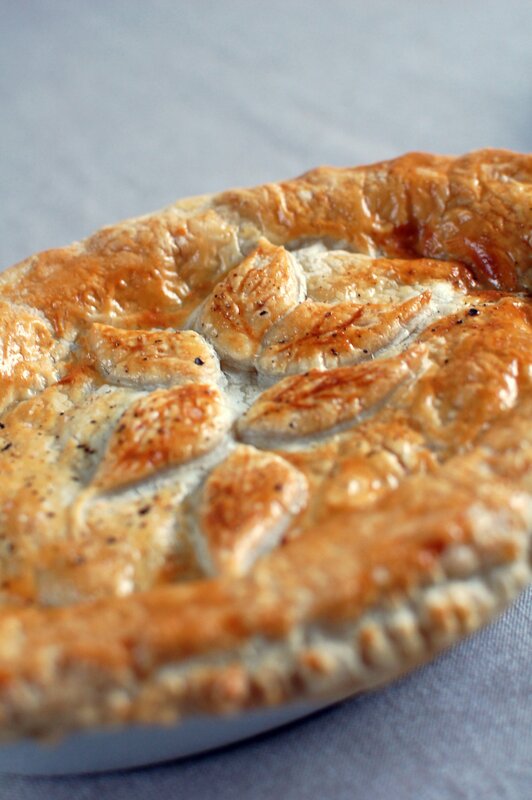 Use the egg wash to glaze the pie and sprinkle the thyme leaves and salt & pepper over the top. Slice and serve with the reserved onion gravy and some greens. Maybe some fat chips. 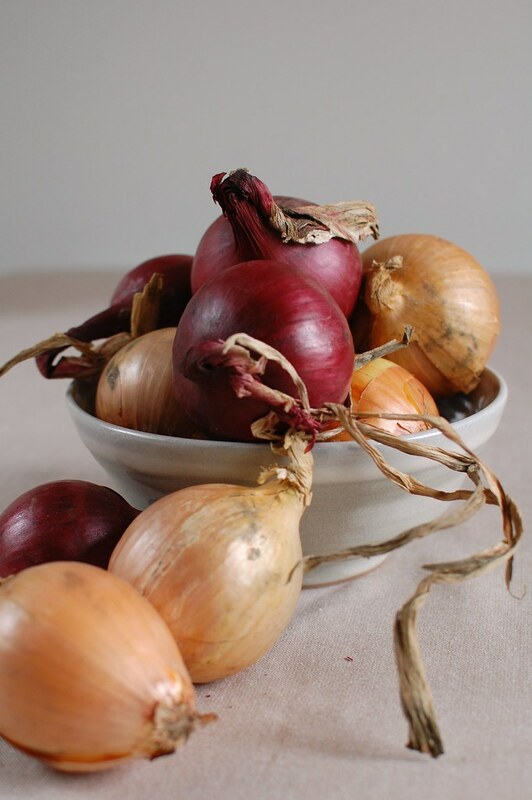 With thanks to Maison Cupcake, for hosting this post and to British Onions for the humongous box of onions.